Existing knowledge on the link between neighbourhood social capital and health suggests that associations vary for different population sub-groups. Previous studies show positive health effects of living in a high social capital neighbourhood for women but not for men. Beyond a gendered pattern, there are reasons to believe that the association between neighbourhood social capital and health differ by age. 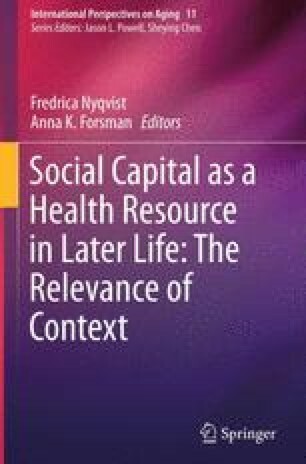 Even if access to (individual) social capital is likely to decrease by age, the health benefits from living in a high social capital neighbourhood might be greater for older than younger people. This study aimed to investigate the associations between neighbourhood social capital and self-rated health for women in different age groups, to understand if the health effects of neighbourhood social capital are influenced by age. Multilevel regression analyses included data on 3230 women (level 1) nested within 49 neighbourhoods (level 2) in the Umeå region in Northern Sweden. The results show that living in a high social capital neighbourhood increases the OR for good–fair self-rated health for older women (60–84 years), while no significant associations was found for middle-aged (31–59 years) and younger (18–34 years) women. Since community involvement tends to be gendered in that women throughout life are expected to be those “creating community”, the health benefits of living in a high social capital neighbourhood for older women might come as a reward after a life-long “duty” of supporting others. A more equal involvement of men and women in community life would potentially benefit younger women, as well as men in all ages.